I am working on an article for my blog knoxgunguy.com, about the new law effective July 1. 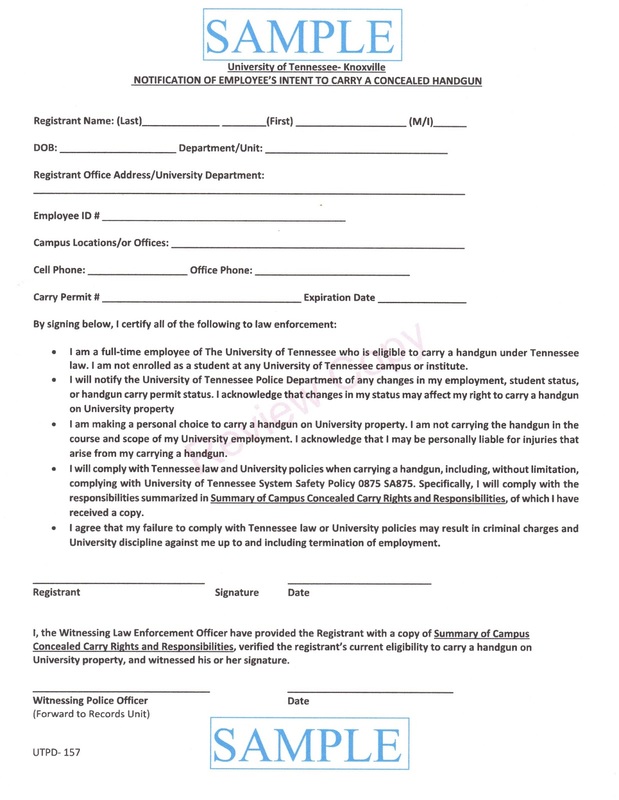 I know that they are required to notify UTPD in writing of their intent to carry. Is there a specified format? Is there a form they are required to complete? Are they required to register their handgun with UTPD, or only supply information about themselves? There is a registration form that must be completed at UTPD and witnessed by a commissioned officer. The information is specific to the employee. See first question and response. The full-time faculty/staff must only register themselves and their permit number, not the handgun itself. You can also visit our department website, which should answer any other questions you may have. Thanks for your response. May I have a copy of the form for publication, please? I hope you will be able to supply me with the form soon. If you can't supply me with the form, who do I need to contact? The notification form is available only to University of Tennessee employees who are full-time faculty or staff and not currently enrolled as a student. If you meet the eligibility to complete the form you may receive a copy by coming in person to the UT Police Department. I am not an employee. However, the public has a right to know. If you won't supply it to me, who at UT has the authority to. Attached is the documentation you have requested. “. . . anyone is capable of making a bad decision, but they just haven’t had enough life experience to take on that level of responsibility." I suppose Chief Lane is unaware that the students he speaks of are legal adults, and have been carrying a firearm practically everywhere else. Many of these are combat hardened veterans who have already made more life-or-death decisions than most of us will make in a lifetime. I'd call that enough life experience. What do you think? Thanks for getting and posting the form. I'm one of those combat vets you mention - only my combat was 25 years ago in Desert Storm. I'm also a 10+ year licensee. My wife (also licensed) is a grad student/TA (and we're both 52). Somehow, when they mention students carrying (or not) they seem to forget my wife (a non-traditional, but still a student) and me (a frequent visitor to campus). I wonder if the next step by the anti-gunners will be to obtain copies of any completed forms under FOIA and release them to the public. Along with all the personal information included therein. Wouldn't be the first time. Yes, that is a concern. Also, I remember a story about a certain chief of police (not UTPD) contacting a certain head coach on a certain matter. I wonder how secure this information is. Will someone at UTPD or up the chain leak the employees' information? Only time will tell. I see, too, that MTSU Chief of Police Buddy Peaster is quoted in The Tennessean, "People on both sides of this issue are looking for an absolute guarantee of safety," he said. "I don't think people's safety and security in life is going to be found by carrying or not carrying." In an ideal world, anywhere anytime carry would be allowed. Much as our enemies try to take our gun rights step by step, we have to expand them in increments. The next step is students with permits, then anyone with a permit.